The road system is impressive. Ring road after ring road. Roads soaring above the city. All needed to carry the increasing volume of traffic. Car ownership fuelled by the cheap cash and debt fuelled economic boom. High powered and expensive cars abound … the wealth trappings of the nouveau riche! Creating environmental and social problems. The growing vehicle pollution problem being addressed with electrification. I originally visited Shanghai in 1994. How it has changed. The Pudong area across the Huangpu River was a swamp. The only way to cross the river was by ferry. The Bund on a cold windy January morning was a deserted walkway. The ferry jetty occupied by crowds of rural people preparing to board large multi-decked ferries to take them far into the interior. One man sat with a complete rear differential of a scrapped truck which I assumed he would convert into a trailer. They were piled with provisions. Waiting patiently. Our trip up the Huangpu River was accompanied by the strained voices of the karaoke performers. The background music the soft lilting sounds of the “pipes”. The financial buildings along the Bund stood with dignity. Beautiful edifices and interiors harking back to the commercial glory of Shanghai in the 19th Century. Although Shanghai is another overcrowded, noisy city it has parts that have retained some character. Unlike Beijing, that is characterless. Walking along the Bund is interesting and enjoyable. Across the river towers of glass, steel and concrete. The new financial centre. Brash, garish and extravagant. Tasteless and inelegant. Structures representing everything exploitative of the West. A system built on debt and excess consumption. We stayed in the area near the Old French Concession and Jing’an Temple. An area abundant with restaurants and interesting sights. To get around the city and see the major sights we took a 2-day Hop On Hop Off bus tickets. There are various options and are good value. We took the 48-hour Bus Tour with 3 attractions. My wife still had a swollen and sore foot after slipping at the Golden Goose Pagoda https://www.rovingretirement.com/xian in Xian. Roger was recovering from a bug which left him feeling very weak. Possibly the same or similar bug that kept me in bed for 2 days in Xian and quite trashed afterwards. 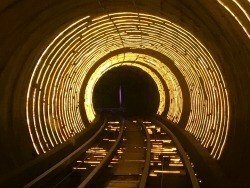 The three options included the short trip under the river through The Bund sightseeing tunnel which was colourful and fun. The fast ascent in the elevator up to the 88th floor observation deck of the Jinmao Tower was an ear popping experience. The third attraction was an interesting hour of sightseeing on the Huangpu river cruise. Over the two days we did the Pudong Tour and the Shanghai City Tour with the added attractions split between the 2 days. The buildings along the Bund have retained their magnificence. It’s worth looking into some of them although in the few we went into we weren’t allowed to take photographs. Where there was swamp is now the finance centre. Building after building of tall glass and steel characterless structures. Chinese big cities are just like any new big city in Asia - concrete, steel and pollution. Building bureaucracies feeding off each other in a corrupt and inefficient loop. The society has a strong focus on anything western … the clothes, the brands and the look. Their culture is being gobbled up by ferocious western values. Buildings and roads and railway systems do not build sustainable wealth. One hopes that somehow the Chinese leadership find a peaceful solution to the monster they have built.